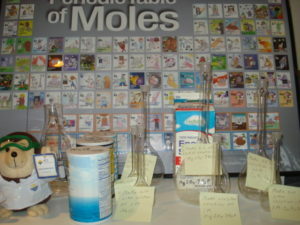 The Union Homeschool ChemClub in Union, New Jersey, made it a fun Mole Day celebration in 2016. With the ChemClub Periodic Table of Moles nearby and a stuffed ACS mole watching over the event (see photo), they started by calculating the molar mass of several chemicals and then prepared different molar concentrations of sucrose, sodium chloride, and magnesium sulfate solutions. After adding their chalk artwork to the sidewalk, they calculated how many moles of chalk they left on the sidewalk. Then they were given a mole of four different metals and had to use their chemistry skills to identify each one. 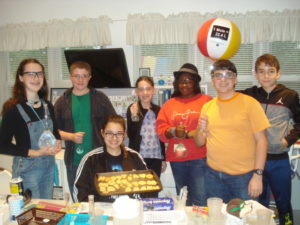 They topped off the celebration by making delicious sugar cookies that spelled out “Happy Mole Day” (see photo).